Esco offers a range of Class III Cabinets that provide the highest level of personnel, product and environment protection against agents assigned to biosafety levels 1, 2, 3 and 4. They are frequently used for handling the deadliest biohazards such as bacteria, viruses and microorganisms. Class III cabinets can be custom-built to suit different process and budget requirements of the client. Multiple Class III cabinets can be joined together in a "line" to provide a larger working space. Several equipment, such as refrigerators, shelves, microscopes, centrifuges, incubators, etc., can be installed inside the Class III cabinets upon request. See below for various applications of Esco’s Class III cabinets. Double-filtered high quality ULPA filtration to ensure that no contamination may happen outside of the work zone, ensuring the safety and welfare of every lab personnel. Exclusive dual exhaust filters provide >100,000 times better protection than single-stage designs. Integrated pass through interlocking doors provides a method of material transfer without compromising work zone isolation and lab safety. Negative pressure environment inside the cabinet provides another level of security in the off-chance that there may be a breach in the isolation system; giving peace of mind to the operator to perform to the best of his abilities without worrying about personal well-being. Esco products adhere to international standards such as American Standard NSF 49, European Standard EN 12469, Australian Standard AS 2252, and Japanese Standard JIS K 3800 among others. Esco is also capable of providing customized solutions that will cater to your processing needs. Esco’s Class III biological safety cabinets is one of the most cost effective solutions available in the market today. Being able to operate in a relatively small footprint, Airstream® Class III biological safety cabinets can fit smoothly into your laboratory especially when space is premium luxury. Airstream® also boast of a user friendly ergonomic design attributed to its angled cabinet front feature allowing an ergonomic working posture for the operator. Double-filtered exhaust air through high-quality ULPA filters (per IEST-RP-CC-001.3) with typical efficiency of >99.999% for 0.1 to 0.3 micron particles, better than HEPA filters. To learn more about Airstream®, click here. Facilities that handle unknown substances with potential of being high-risk, such as departments involved in homeland security or health governing departments, must be equipped with proper isolation technology to have a safe and secure containment of the substances. Esco class III biological safety cabinets are well equipped to provide the containment requirements of such facilities. Esco’s containment barrier isolator (CBI) Provides Operator Exposure Levels (OEL’s) ≤1.0 μg/m3 during controlled operations providing optimum operator safety for substances such as toxic industrial chemicals (TIC), toxic industrial material (TIM) and Non-Traditional Agents. Aside from these agents, there are also highly infectious microbiological agents which needs to be handled properly. Manipulation of substances within the CBI is made possible by the one piece leak tight sleeve-glove. CBI facilitates the complete isolation of substances that is processed inside while providing sterile/aseptic environment at the same time; ensuring that contamination on either side will not be a problem. On top of this, the CBI can be configured and integrated with whatever customized function that your process might require. We at Esco understand that every laboratory has its own preference, whether it be in its process or equipment which sometimes causes integration issues when it comes to upgrading or adding additional equipment. Esco provides not only the equipment required for various laboratory and industry applications but also provide the engineering knowledge and expertise to integrate this into an existing system or to build it from the ground up. Esco in partnership with TapestleRx can provide whole clean room solutions that will cater to your specifications. Both the equipment and the cleanroom adheres to the most stringent international standards in existence. Esco class III biological safety cabinets can be used across different field in different various applications. Esco provides its customers with accessories that will not only promote operation efficiency but also allow seamless integration of different processes. Rapid Transfer ports (RTP) are containers with the purpose of transferring objects in in and out of barrier containment without compromising the isolated environment. These RTPs comes in different sizes and shapes depending on user requirement which then can be integrated into the BSC units themselves or mounted on walls to provide a systematic custody transfer of objects. Biovap is a biodecontamination system by Esco that can be integrated to its class III biological safety cabinets. This decontamination system uses vaporized hydrogen peroxide for decontamination. Traditionally, in order to be able to do formulation and filling, whole clean rooms must be prepared. Clean room construction is not only costly but also takes a several months, if not years, to construct. Aside from this, the maintenance and operation cost of having a cleanroom is another financial burden that a manufacturer needs to consider. This has hindered pharmaceutical industries in the past due to the heavy financial commitment required. 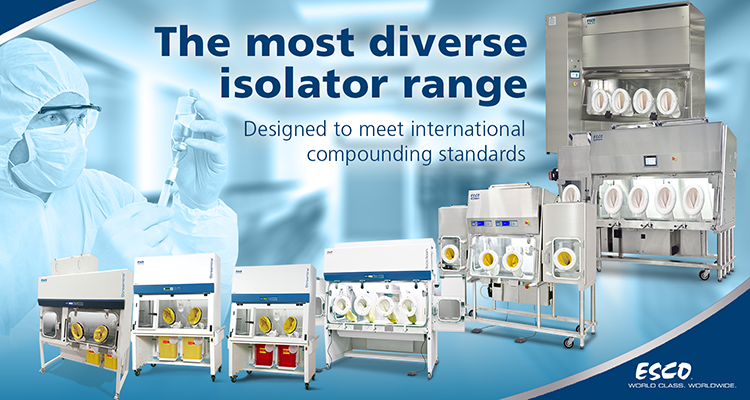 Nowadays, isolators are being accepted as a cheaper alternative to these cleanrooms. An isolator can easily be commissioned within a few days after on-site delivery and can be used immediately after. Initial cost and maintenance cost of an isolator is also relatively cheaper as compared to completing a whole clean room facility. Esco class III biological safety cabinets and isolators are able to provide the aseptic environment required for pharmaceutical formulation and filling. Using the latest innovative technologies in filter and airflow control, Esco cabinets and isolators guarantees sterility with absolutely no containment breach under normal use. Furthermore, Esco’s innovative technology combines robotics and isolation containment bringing filling line technology to a whole new level. AseptiCell™ is a fully integrated and isolated system for pharmaceutical filling into ready-to-use containers. Extracting, isolation and preparing seed cells for cell culture might provide some aseptic challenge if not done in a proper environment. Seed cells might get contaminated by unwanted foreign objects such as dust or airborne pathogens which would result in undesired products or total failure of the cell culture. On the other hand, cells with pathogenic properties and/or are infected with pathogens which may cause human or environmental harm must be kept isolated. Whichever the case may be, Esco has the capability to supply the isolation containment that you require. Whether it be an aseptic isolator to protect your cells or containment isolator to prevent environmental contamination, Esco has the products for you. Esco also enjoys being a leader in cell culture technological innovation. Esco TideCell bioreactor uses emerge-submerge principle of cell culture wherein aeration and media submersion of the cells are done alternatively, giving the cells the best environment to grow and multiply without having to worry about foaming. This technology combined with our patented BioNOC™ II micro-carriers provides more surface area per volume of micro-carrier, allowing higher cell density in a relatively small amount of space. Why settle for one if you can get both? Combining our superior and innovative bioreactor system with the aseptic containment guarantee of our barrier systems, we bring you the CradlePro-Iso. Now no cell culture process will be compromised, whether it is seed cell preparation or the actual cell culture, nor will environmental and operator safety be compromised in any way. Pre-clinical stage of vaccine development involves animal testing. Usual animal subjects are mice or monkeys wherein the vaccine will be tested whether it could invoke an immune response or not. By doing this, researchers of the effect it might have on human cells. Infecting animals with infectious and potentially harmful pathogens creates the risk of outbreaks in case of containment breach. As such, it is ideal that these experiments be done inside a barrier isolator with negative pressure. Esco’s containment barrier isolator (CBI) not only provides superior operator protection but also protects the welfare of the animal from external factors while being infected. The CBI boasts of operator exposure levels (OEL’s) ≤1.0 μg/m3 during controlled operations through physical barrier isolation and negative internal pressure. The CBI also comes with an integrated pass chamber which allows the entry and exit of the subjects without breaking containment. Containment or isolation in an agricultural setting focuses on preventing the escape of subjects, whether plants or animals, under study to the environment which might have a negative impact on the environment, whether it be through soil, air or water. These subjects might be carriers of high risk pathogens or pathogenic agents as well as genetic modification which might have unknown consequences. Although operator safety and public health is always a point of consideration, focus of the containment is still on preventing the subject of study, or any substance thereof, from escaping into the environment. In another context, containment might also be used in veterinary applications such as industrialized farming to avoid pathogenic outspread in the case of livestock epidemic for example. In this case, groups or herds of animals are put into containment such that 1) the pathogens of infected animals are contained 2) healthy animals will not be infected. Esco can provide the containment solution for any of these scenario. Our class III biological safety cabinets can be configured for either positive pressure for maximum product protection or negative pressure for maximum operator and environmental protection.